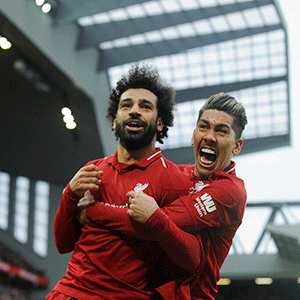 Liverpool - Liverpool moved back top of the Premier League in dramatic fashion as Toby Alderweireld's last minute own goal beat Tottenham 2-1 at Anfield on Sunday. Jurgen Klopp's side move two points clear of Manchester City once more at the top of the table, but City have a game in hand. Liverpool's hopes of ending a 29-year wait to win the title looked set to be dealt a massive blow as Lucas Moura's strike 20 minutes from time cancelled out Roberto Firmino's early opener. However, Hugo Lloris could only palm Mohamed Salah's header into the path of the unfortunate Alderweireld to condemn Tottenham to a fourth defeat in five Premier League games. Spurs are now in serious danger of crashing out of the top four as they remain level on points with Manchester United and could be usurped by north London rivals Arsenal into third should the Gunners beat Newcastle on Monday. And the visitors will be left to regret a huge missed chance by Moussa Sissoko five minutes from time when Liverpool were wobbling. The hosts had got off to the perfect start when Firmino headed home the opener on 16 minutes from a delightful Andy Robertson cross. That was Robertson's 12th assist of the season from left-back and the Scotland captain was involved again in a flowing move moments later as he forged down the left and neat touches from Salah, and Georginio Wijnaldum teed up Sadio Mane to curl just wide. Tottenham boss Mauricio Pochettino was serving the last of a two-game touchline ban and without the guiding hand of the Argentine, they lacked inspiration in the final third. However, Liverpool were often causing their own problems by gifting away possession inside their own half and Dele Alli pounced on a slack pass by his England teammate Jordan Henderson to power a volley that dipped just over the bar with Spurs' best effort of the first-half. Virgil van Dijk had a great chance to double the hosts' lead at the start of the second period, but the Dutch defender headed over after a well-worked short corner between Trent Alexander-Arnold and James Milner. However, Liverpool were thankful again to Robertson at the other end as he made a vital block to prevent Christian Eriksen firing home the rebound after Alisson Becker was forced into his first save of the afternoon by Harry Kane. When these two sides met at Anfield last season, Salah scored one his many goal of the season candidates amidst an incredible 44-goal campaign. The Egyptian still has a respectable 20 this season, but only one of those has come in the last 11 games and he passed up a great chance to give Liverpool some badly needing breathing space when his shot was blocked by Alderweireld with Mane better placed and begging for a pass. That missed opportunity looked costly as Tottenham struck back. Kane's quick thinking and excellent long-range pass picked out Kieran Trippier, who fed Eriksen and his scuffed shot fell perfectly for Moura to turn home. As Liverpool surged forward in search of a winner, Spurs could have picked them off as Sissoko blazed over with just Alisson to beat before Alli clipped a shot inches wide. Instead, there was delirium in front of the Kop end as Lloris should have handled Salah's header, but instead parried the ball into Alderweireld and the ball ricocheted over the line to breathe fresh life into Liverpool's title challenge.